An anti bullying programme has benefitted from a generous financial donation by the Argus Group. The donation will give Sandys Secondary Middle School the opportunity to offer the programme to its students for the Fall of 2013 for free. Chain Reaction Bermuda is a preventative programme aimed at combatting bullying and violence in schools by promoting kindness, respect and understanding. It is one of numerous gang prevention measures in schools and is being offered in Bermuda’s schools for three years in selected government schools for students aged between 11- to 18-years-old. The programme offers student leadership training for student leaders to serve among their peers. Alison Hill, Chief Executive Officer of the Argus Group, said: “The Chain Reaction programme teaches values and a sense of belonging, while offering a safe environment for children to express their fears and grow as individuals. Argus is pleased to contribute to such an important programme to help better the lives of the next generation of Bermudians”. 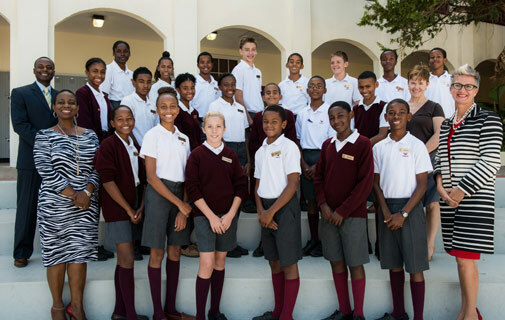 Karen Raynor, Deputy Principal, Sandys Secondary Middle School, added: “On behalf of Sandys Secondary Middle School, I thank Argus for their financial support and for enabling us to offer this programme to our students. The programme teaches students a great deal about respect, kindness and generosity. Our students are grateful for the opportunity to participate and experience all that Chain Reaction has to offer”. The Chain Reaction programme was launched on October 11 at Sandys Secondary Middle School and is open to all students. For more information, visit: www.chainreactionbermuda.org.